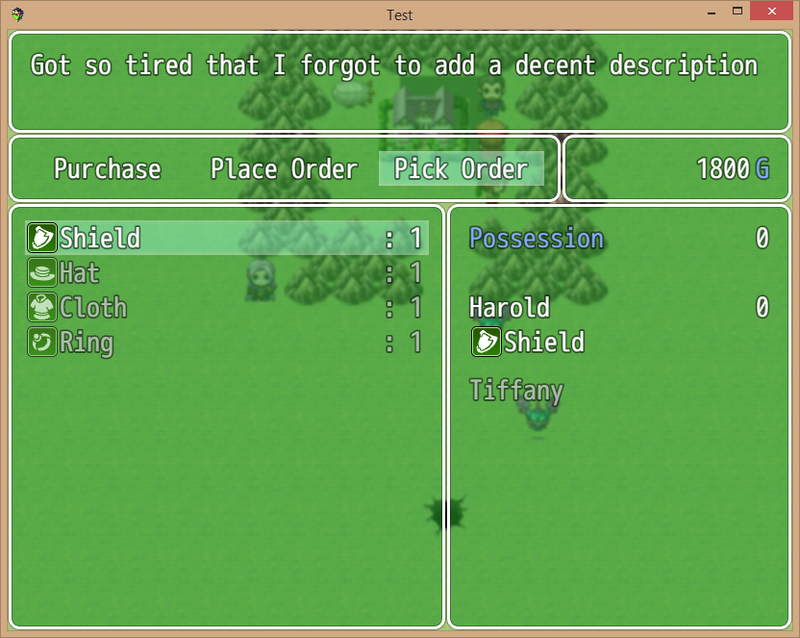 This script allows you to setup a discount card and coupon system in your project so every time the player visits a store he or she may get a specific discount on a certain item available at the time. This benefit the player might get then depends on the percentage defined in the corresponding discount item price in the Item database tab. Now you may also check how many steps are left before a discount card expires naturally. You may also setup exclusive store discount cards as well, you just need to include some specific data in the EXCLUSIVESTORES Constant and setup some in game variable to store that exclusive store code, either 1 or 1789 or whatever you'd prefer there. 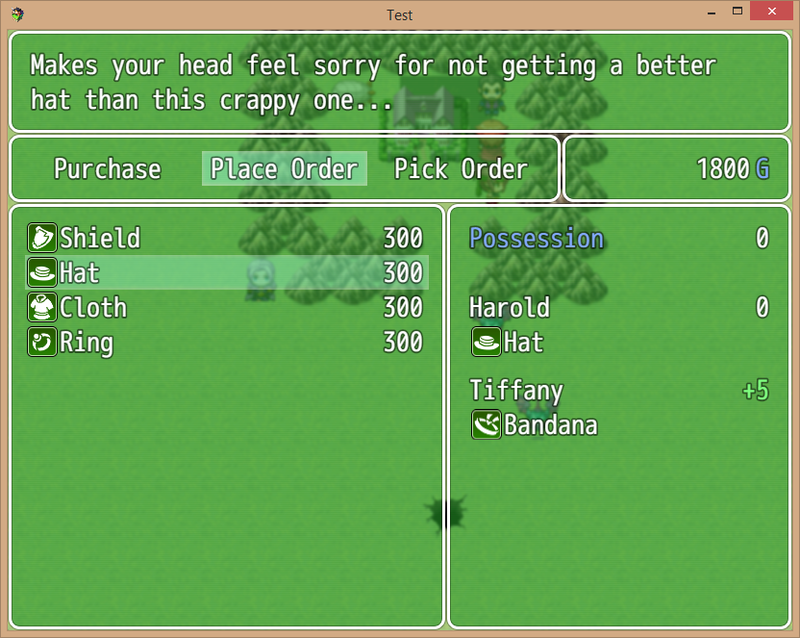 By the way, the player can now place orders to get items that are not currently available at the store. You need to setup the Constants found in the KyoShop module and the corresponding items in the Item database tab to make the script work properly, and don't forget about the script calls if you want to enable the Place Order feature in your game project. There is also the possibility to setup all the shops' scarcity level for all shop items by calling KyoShop.scarcity_lvl = desired level, 0 would be the lowest level ever. The maximum level depends on your laziness! Just go read the instructions included in my script. Since version 1.6.0 you need to place the contents of kyodiscountsxptool.rb in a separate section in the script editor, right above KyoDiscounts XP. It is a temporary script that might be called a parser since it reads the template TXT files, following the shop item list any-number.txt naming convention, used in the creation of the custom price increases and decreases. That tool is not supposed to be distributed with your closed demo or finished game project! In this version you would normally use some Plugin commands, but I felt like they didn't help me configure a lot of stuff at the same time so I used script calls in a similar way I would use them in RGSS (in XP, VX or VX Ace). I included some examples there, but I guess I better explain one of them, the one that handles items, weapons and armors. 'i21' would stand for Item # 21, while 'w12' stands for Weapon # 12 and 'a9' stands for Armor # 9. Add as many variants as you wish to the $gameTemp.orderGoods array. Now you can download the scripts for XP, VX and MV in English and Spanish, and a demo (Spanish version only). You may include it in any commercial and non commercial RM projects, credits go to me, its scripter. Yeah, I will ask you to make some payment in case you go commercial. Bumping is the same as getting bored and suddenly find a poor excuse to update a script. I already updated my KyoDiscounts XP script to let the game developer pick the best button to open the Discount Window while in the shop menu, and to let him or her force the discount cards expire for whatever crazy reason they might have to do such a terrible thing during gameplay. I also updated the in-script instructions accordingly including two new script calls that might blow up a player's mind in the middle of his or her game session. I Bump because I'm addicted to adrenaline... or to any screen. Now you can also setup exclusive store discount cards as well, actually it's not difficult to handle. Those exclusive cards won't work in a store that doesn't have the same store code as the card's. This script is super cool! I haven't tested it thoroughly yet, but the thought of having a special store where you can get discounted items if you have the proper coupon? Now I can get the Buster Sword at 25% off! Version 1.1.4 is now available! Now exclusive discount cards will only work in exclusive stores while common cards will only be accepted at common stores. Well, coupons are not item specific, but you will spend one every time you buy, let's say 20 potions. Then you will another coupon to buy a Mithril Sword and so on. Cards are more convenient because you can make several purchases before they expire (after their steps left reach zero), but they are rechargeable so to say. Is It Good To Be The Bump? Version 1.2.1 is finally available here! I fixed a few things that didn't work like the remaining steps not showing up on the Item menu or the Purchase Discount submenu, but the most important thing you should now is that the player is now able to place orders to get extra items. The excuse you as the game developer may use there could be that it takes time to fetch the requested items or they are supposed to be available at another store only. I do think it is one of KyoDiscounts XP best features IMHO. You see, Version 1.2.3 has arrived to this board! This new version of my script features some changes like making the Placed Orders Commission Fees and Steps quite customizable. In a previous version I also had to fix a minor bug, nothing important to be honest. I hope you enjoy this well crafted script a lot! Now version 1.2.4 is available! This version makes it a bit harder to guess how many steps the player would need to do before a placed order package finally arrives at the store. I thought that would make it more realistic than before. I hope you all like it as much as I do, he, he, he, rero. Or something like that. The truth is that I just published another JS file on mediafire and mega, it's the KyoDiscounts MV version 1.0.0 script or plugin. It features pretty much everything I included in the XP version. Now I'm thinking about porting my script to VX or VX Ace as well. I just hope my head won't be blown into smithereens in the process, especially after what I had to go through while getting used to MV's scripting style. I hope those lonely alley cats we may find out there enjoy it a bit at least. 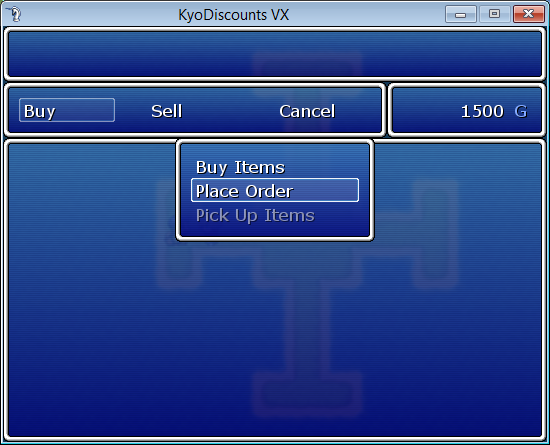 I had to update KyoDiscounts MV to make sure I would minor fix a graphical bug found in the number window, and add the placed orders commissions feature to the plugin. I just uploaded another version of my plugin for RMMV, it mainly adds a few additional data on the number window like the basic price and the commission fee. Nothing to worry about at all. The Bump Didn't Forget VX At All!!! As you may have noticed already I have uploaded a new version of KyoDiscounts, but this time it was RMVX's turn! It already includes the save features included in the RMMV version, but it's not as complete as the RMXP one for now. I hope all RMVX users enjoy it!